Hey all you crafters out there! I just heard about a new product and thought I’d give it a try. I would refer to myself as more of an upcycler or Do It Yourselfer, but I do dabble in crafts and homemade gifts. This product may not be totally new, but it is new to me and maybe to you too. 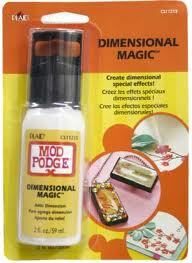 I already love Modge Podge, but this stuff is really cool. I actually bought it specifically to use for a school project. This medium is impressive. Basically you can use it to add dimension to crafts, jewellery, cards and other projects. When you apply it, it appears milky, but will dry clear. The Craft Critique gives a really good description of the product and how it’s used. I decided to cover the surfaces of the medals and the trophy plate with awards that would fit with my program. I made them out of paper, but knew that they would not be very durable if left like that. When I heard about the dimensional podge, I thought it would be perfect for this project. I simply applied an even layer over the entire paper surface on the medals and got down in the little groove between the paper edge and the medal. I let them dry for 24 hours and they look good and feel hard as rock. I am hoping that they will be as durable as they seem. You will notice that the paper seemed to be curling slightly when I applied the podge. (See wet podge slide.) I was a bit worried about how this was going to turn out, but when it dried, there were no issues with the paper bubbling up or appearing warped. Although you might not be interested in upcycling sports medals, this product could work for a variety of other projects. It was easy to use and I am really pleased with how they turned out. It is a bit hard to see the dimensional surface on my project, but if you good Modge Podge Dimensional Magic, you will see lots of great ideas under Google images.